Porsche Cayenne E-Hybrid 5dr Tiptronic S 2019 Review | What Car? 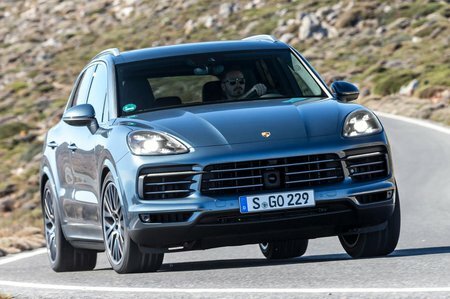 You get a reasonable amount of kit in the standard Cayenne, including a 12.3in infotainment system with sat-nav, DAB radio and Apple CarPlay, LED headlights, cruise control, two-zone climate control, electric part-leather seats and an electric tailgate. Even so, you’ll probably still end up raiding the options list. For the E-Hybrid, as well as the standard Cayenne’s kit list, you get the means to charge your Cayenne through either a wall-mounted charger or domestic socket, bespoke functions for the virtual instrument cluster and sat-nav, and green-painted brake calipers. This plug-in hybrid version of the Cayenne matches a 3.0-litre V6 petrol engine with an electric motor. You can accelerate (softly) up to 84mph on electric power alone, and drive for up to 27 miles before the petrol engine joins in. It’s an impressive collaboration, offering zero-emissions driving in the city while still fulfilling Porsche’s sporting brief elsewhere.